Carolina Panther, Ryan Kalil is not only a talented professional athlete, but a humble, organized guy. 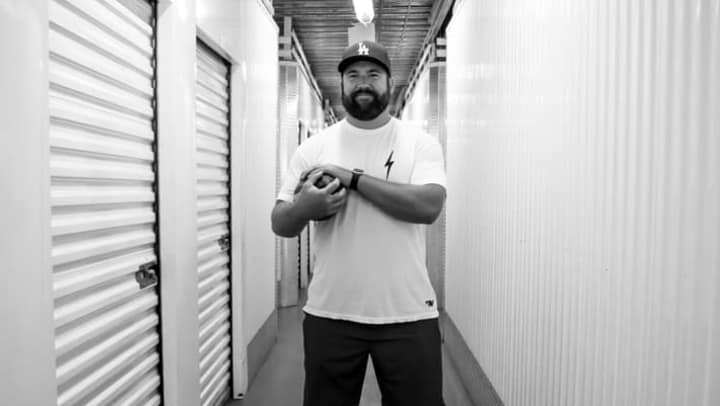 StorQuest had the chance to catch up with the football center this past week at one of our Los Angeles facilities where we learned a little more about how he Makes Room For Awesome both on and off the field. We chatted about some of his other athletic interests and Ryan candidly noted “I have one skillset. So I do not participate in any other sports than football. I’m pretty good at blocking and that’s about it. I get teased quite often by my teammates for that, but a lot of them think they’re way better athletes than they are anyways.” Can’t fault him for honesty! Ryan also strives to be the best in his daily life – both on and off the field. The player “take(s) a lot of pride in knowing all the little intricate details and things that I’ve put in the time each and every day over my career that many people don’t know about…” Keeping organized in all aspects of his life certainly plays a role as one of those integral details. When it comes to leaving his mark on the NFL, Ryan “want(s) to be best known for being a team guy a team player. I think it’s easy to sorta get lost in your own ambitions and your own goals but ultimately it’s a team game and it sounds like a cliché but I think that the players that I’ve admired most are the guys that always put the team first.” Right on Ryan. While he contributes to running the field, the football star and family-man’s next adventure is centered around his family. “It’s going to be whatever the family wants to do. I have four kids, and I know they really want to travel so I’m all about that. I think that’ll be exciting for me to be able to take them to places I didn’t get to see when I was younger.” And his StorQuest unit will be waiting for him when he returns.